This is a beginner’s guide to Docker which is a way to isolate and run entire applications. With Docker it doesn’t matter if you are using a Mac, Windows, or Linux computer anymore. The entire development environment is isolated: programming language, software packages, databases, and more. With Docker we now longer have to mess around with virtual environments. We can faithfully reproduce a production environment locally. And Docker can be shared among team members so everyone is working on the same setup. Wins all around. What’s the downside? Complexity. Docker is a complex beast under the hood. However a little knowledge can take you a long way and that’s the goal of this guide! Docker is really just Linux containers which are a type of virtualization. Virtualization has its roots at the beginning of computer science when large, expensive mainframe computers were the norm. How could multiple programmers use the same single machine? The answer was virtualization and specifically virtual machines which are complete copies of a computer system from the operating system on up. If you rent space on a cloud provider like AWS they are typically not providing you with a dedicated piece of hardware. Instead you are probably sharing a physical server with hundreds or even thousands of other clients. What’s the downside to a virtual machine? Size and speed. A typical guest operating system can easily take up 700MB of size. So if one physical server supports three virtual machines, that’s at least 2.1GB of disk space taken up along with separate needs for CPU and memory resources. Most computers rely on the same Linux operating system, so what if we virtualized from that level up instead? Wouldn’t that provide a lightweight, faster way to duplicate much of the same functionality? The answer is yes. And in recent years Linux containers, also known as “containerization,” has become increasingly popular. For most applications, a a virtual machine provides far more resources than are needed and a container is more than sufficient. This, fundamentally, is what Docker is. A way to implement Linux containers! An analogy we can use here is that of homes and apartments. Virtual Machines are like homes: stand-alone buildings with their own infrastructure including plumbing and heating, as well as a kitchen, bathrooms, bedrooms, and so on. Docker containers are like apartments: they share common infrastructure like plumbing and heating, but come in various sizes that match the exact needs of an owner. If you are a Python programmer (like me) a common question at this point is, what about virtual environments? How do they differ from containers? Virtual environments are used to isolate Python software packages locally. We can create an isolated box for individual projects so one can use Python 2.7 and Django 1.5 while another can use Python 3.5 and Django 2.1 on the same computer. Virtual environments are great. But…virtual environments can only isolate Python packages. They still rely on a global, system-level installation of Python albeit they can refer to the proper version. So when we use Python 2.7 in a project, we’re pointing to an installation of Python 2.7 on the computer itself, not actually within the virtual environment. Also we can’t run a production database or other services within virtual environments so compared to Docker containers they are far more limited. Ok, enough theory. Let’s start using Docker before we explore further concepts. To install Docker we need to download the desktop app on our computer. The initial download of Docker might take some time to download. It’s a big file. Feel free to stretch your legs at this point! Once Docker is done installing we can confirm the correct version is running. It should be at least version 18. Docker Compose is an additional tool that is automatically included with Mac and Windows downloads of Docker. However if you are on Linux, you will need to add it manually. You can do this by running the command sudo pip install docker-compose after your Docker installation is complete. Now run the command below to confirm you have a working version of it, too. The version should be at least 1.23.x. To confirm Docker installed correctly we can run our first command docker run hello-world. This will download an official image and then run the container. We’ll discuss both images and containers shortly. ch runs the executable that produces the output you are currently reading. A good command to inspect Docker is docker info which we can run now. It will contain a lot of output but focus on the top lines which show we now have 1 container which is stopped and 1 image. Want to inspect just the current image? There is the hello-world image which we just downloaded. How about inspecting containers, either running, paused, or stopped? I have shortened the actual about for CREATED and STATUS to fit but we can see the container for hello-world. The NAMES here, musing_raman, is randomly created by Docker unless we specifically set it so your name will likely be different. Also, why do we need ls -la here instead of ls? The answer is because the container is stopped! Only running containers will appear with docker container ls. Images and containers are the two fundamental concepts to grasp when you start with Docker. An image is a snapshot in time of what a project contains. A container is a running instance of the image. When we ran hello-world we used an official Docker image. We did not have to create the image ourself. But typically we will create custom images and we do so using a Dockerfile. We also will use docker-compose.yml files to run the containers. There are a large number of official images available on Docker Hub for common software like different flavors of Linux, programming languages, and so on. For example, the Hello World image is there. Ok, let’s create our own image for something more “real.” How about the Python programming language? We can create an image and container just for Python and later add on to it. First create a local directory on your computer for our code. I’ve chosen to make a code folder on my Desktop (I’m using an Apple computer) and then a python3.7 folder within that. Now we need to define the image with a Dockerfile. This is similar to a Pipenv or a requirements.txt file; it is a list of all the requirements needed to build our image. It is simpler to have them all in one place rather than install each manually line-by-line. If you are on a Mac, you can create a new Dockerfile on the command line using the touch command. With your text editor add the following single line of code to the Dockerfile. Dockerfiles are read from top-to-bottom. The first instruction must be the FROM command which lets us import a base image to use for our image. This base image could be another Docker image or one we create entirely from scratch. In this case we’ll be using the official Docker image for Python 3.7, specifically the alpine version which includes only the bare minimum needed to run Python. The alpine version takes up 78MB of space versus full Python’s 923MB so it is a good option to start with! With our instructions complete it’s time to “build” or create the image for the first time. Don’t forget that period . at the end of the command! $ docker image build . There will be a lot of output here ending with Successfully built and the hash id, aadc3feb2b19, for the image. The actual id hashes may change by the time you read this post as each image continually updated by the Docker community. Our tag means we can refer to the image going forward as img1 rather than aadc3feb2b19. Much better, no? We can list all existing Docker images to confirm this new one has been built alongside the initial alpine image. There are currently two images: the hello-world image we previously downloaded and one for python we just built. Every image is made up of one or more image layers. The base layer is often a flavor of Linux, like alpine. Notice that when we installed alpine there was only a single image used which had the ID 4fe2ade4980c. But when we built the image for python:3.7-alpine this image depended on five other images. We can see this in the build output. Image layering helps for two main reasons. First, each image layer is immutable–unchanged–like a git commit. This helps ensure consistency when two developers build the same image. The second reason is performance. Docker caches the steps in a Dockerfile to speed up subsequent builds. When a change is made to a step, all steps following it will be executed from scratch. For this reason, order matters in a Dockerfile. Typically you want to put code that won’t change often at the top and code that will change at the end. We’ll see this in action shortly. Now that we have our Python image how do we run it? Well just as a Dockerfile is a list of image instructions there is also a docker-compose.yml file that is a list of container instructions. To demonstrate a real-world image and container example we will now “Dockerize” a basic Django web app. You might not fully understand every step but you’ll see how Docker can work to run a web application completely on its own. Note: If you’ve never used Django before, I’ve written several books on it which have the first few chapters available online for free. Check out Django for Beginners. Ok, so let’s create a new Django project from scratch. I’ll assume you have Pipenv already installed. If not, see here for further instructions. On the command line, go up a directory to our code folder and create a new one called djangoapp. Then we’ll use Pipenv to install Django and enter the virtual environment shell. This creates both a Pipfile and a Pipfile.lock. Now create an example_project that we’ll put in our current directory. Don’t forget the period . at the end of the command here! (djangoapp) $ django-admin startproject example_project . And then we can use runserver to start this new Django project. 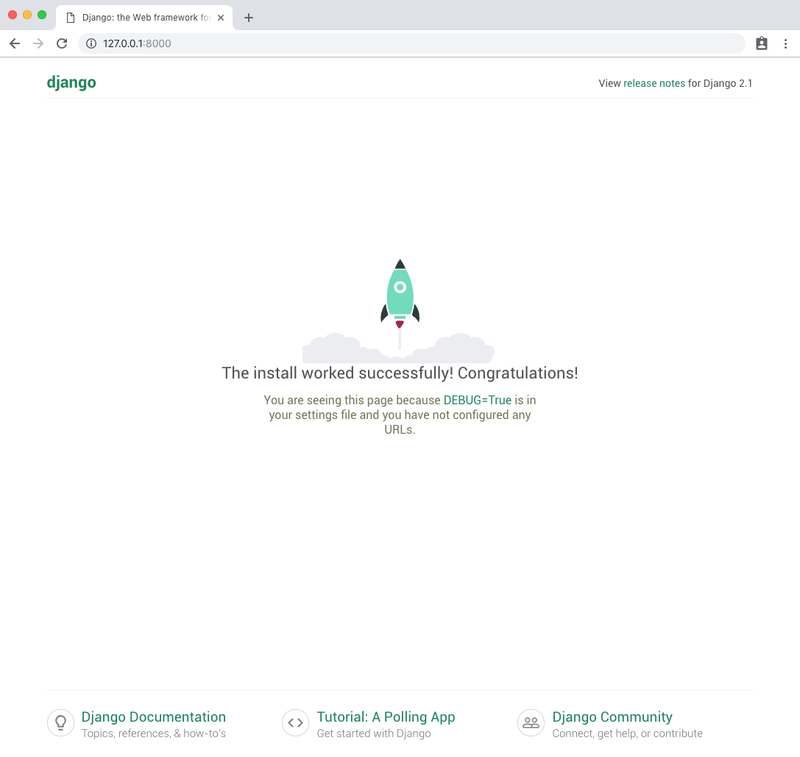 Assuming everything worked correctly, you should now be able to navigate to http://127.0.0.1:8000/ and see the Django Welcome page in your web browser. Awesome. Done! Now let’s run all of this with Docker instead. Stop the local server with the command Control+c. And exit the virtual environment by also typing exit. You should no longer see (djangoapp) at the beginning of your command line prompt. As a final step let’s confirm what exists in our local directory now. We’ll now create a Dockerfile for our image which will completely replace our local dev environment, so this will have Python 3 and Django. Then we’ll add a docker-compose.yml for the container instructions. Make each file via the command line. This Dockerfile has several commands. RUN, COPY, and ADD each create a new layer. Order matters in Dockerfiles since they are executed from top-to-bottom. First we use FROM to install python:3.7-alpine as our base image and set two environment variables with ENV. The first, PYTHONDONTWRITEBYTECODE will remove .pyc files from our container which is a good optimization. The second, PYTHONUNBUFFERED will buffer our output so it will look “normal” within Docker for us. Then we used the WORKDIR command to create and set /code as our default directory within Docker. That means if in the future we want to run a command like python manage.py runserver we don’t have to also specify it should be run in the /code folder. And then we install Pipenv itself via pip and then run pipenv install to install the software packages in our Pipfile. Note that we added the --system tag so that software packages are available throughout the entire container, not within a virtual environment which is Pipenv’s default but doesn’t make sense here since the entire Docker container is a virtual environment. An important point to make here is that the order in a Dockerfile matters a lot. Because of layer caching when a step changes in the Dockerfile, all subsequent work needs to be redone. For example, the very last line here is COPY . /code. That means any code changes locally will be copied over. However there are no commands after that; nothing else needs to be rebuilt. If we had put this command earlier in the Dockerfile, say, before we install the Pipfile, then every time there is a local code change all our requirements would have to be reinstalled on the image. Wasteful. Without going too far down this rabbit hole, remember that order is extremely important for performance and managing image size. At the top we specify we’re using the 3.7 version of Docker Compose and then set up a service, which is running within our container. Multiple services can run within a Docker host–for example, we might add a db service for a running PostgreSQL database in the future–but for now we have a single web service. We tell it to build the current directory, execute runserver on startup which will start the Django server. Then volumes will sync our local directory to the Docker container. And as a final step we expose port 8000 which is Django’s default so the container will expose it, too. Instead of running separate commands to build the image and run the container we can do that with one now. Check this out! web_1  | System check identified no issues (0 silenced). web_1  | You have 15 unapplied migration(s). Your project may not work properly until you apply the migrations for app(s): admin, auth, contenttypes, sessions. web_1  | Run 'python manage.py migrate' to apply them. web_1  | Quit the server with CONTROL-C. There will be a lot of output here but if it all worked you can now visit http://127.0.0.1:8000/ in your web browser and see that Django is running entirely within a container now. Yay! That last example with Django probably felt a bit too fast to fully understand. And that’s ok. I wanted to show a working example without getting too bogged down in the complexity of images and containers. Containers are stateless and ephemeral in nature. We can link the local filesystem via volumes but things become more complex with databases (which we didn’t cover here). If you’d like to go deeper with Docker a fantastic resource that I used myself, and now recommend to others, is the Dive into Docker video course.